In this lesson, we will learn how to solve problems involving moving a particle on a smooth inclined plane. A body is held at rest on a smooth plane which is inclined to the horizontal at an angle of 𝜃 . The body is released and slides down the plane under the action of its weight. What is the acceleration of the body in terms of the gravitational acceleration 𝑔 ? If a body of mass 3 kg was placed on a smooth plane inclined at to the horizontal and was left to move freely, determine its acceleration. A body was projected at 16 m/s up a smooth plane inclined at an angle 𝛼 to the horizontal, where s i n 𝛼 = 4 5 4 9 . Determine the time that the body took to return to the point of projection, Take 𝑔 = 9 . 8 / m s 2 . A body of mass 0.7 kg was placed on a smooth plane inclined at to the horizontal and it was left to move freely under the effect of gravity, where the acceleration due to gravity is 9.8 m/s2. Find the magnitude of the reaction of the plane to the body. A body of mass 𝑚 was placed on a smooth plane inclined at an angle 𝜃 to the horizontal, where t a n 𝜃 = 3 4 . A force of magnitude 77 kg-wt was acting on the body along the line of greatest slope up the plane. Given that this force caused the body to start moving up the plane and that it covered 196 cm in 2 seconds, find the mass of the body 𝑚 . Take 𝑔 = 9 . 8 / m s 2 . A body of mass 10 kg is placed on a smooth plane inclined at to the horizontal. A horizontal force of magnitude 15 kg-wt is acting on the body towards the plane. The line of action of the force, the body, and the line of greatest slope all lie in the same vertical plane. Taking , determine the magnitude of the normal reaction of the plane on the body. A body of mass 9 kg was moving along the line of greatest slope of a smooth plane inclined at 6 0 ∘ to the horizontal. A force of 3 kg-wt was acting on the body, where the line of action of the force was directed towards the plane at 3 0 ∘ upwards of the horizontal. Find the magnitude of the normal reaction of the plane on the body. Take 𝑔 = 9 . 8 / m s 2 . A body of mass 16 kg was placed on a smooth plane that was inclined at 4 5 ∘ to the horizontal. A horizontal force of 48 kg-wt was acting on the body towards the plane. Given that line of action of the force, the body, and the line of greatest slope all lie in the same vertical plane, determine the acceleration of the body. Consider the acceleration due to gravity to be 𝑔 = 9 . 8 / m s 2 . A body of mass 1 0 √ 3 kg was placed on a smooth plane inclined at 3 0 ∘ to the horizontal. A horizontal force of 126 N directed towards the plane was acting on the body such that the line of action of the force and the line of greatest slope of the plane all lie in the same vertical plane. After moving for 7 seconds, the body reached a speed 𝑣 , at which point the force stopped acting, and the body continued moving until it momentarily came to rest 𝑡 seconds after the force stopped acting. Find 𝑣 and 𝑡 . Take 𝑔 = 9 . 8 / m s 2 . A body of mass 6 kg was moving along the line of greatest slope of a smooth plane inclined at 6 0 ∘ to the horizontal. A force of 28 kg-wt was acting on the body such that the line of action of the force was directed towards the plane at an angle of 3 0 ∘ upwards of the horizontal. Find the magnitude of the normal reaction of the plane to the body. Take 𝑔 = 9 . 8 / m s 2 . In a factory, boxes are transferred between two floors via a smooth inclined plane of length 15 m and height 12 m. The boxes are released from rest at the top of the slope and left to slide down freely. Taking 𝑔 = 9 . 8 / m s 2 , determine the velocity of a box when it reached the bottom of the plane. A body of mass 205 kg was left to slide down a plane inclined at 4 5 ∘ to the horizontal. A force started acting on the body causing its acceleration to halve. Given that the line of action of the force made an angle of 4 5 ∘ with the line of greatest slope of the plane and that they both lie in the same vertical plane, find the magnitude of this force. Consider the acceleration due to gravity to be 9.8 m/s2. A body of mass 25 kg was placed on a smooth plane inclined at an angle 𝜃 to the horizontal. Sliding down the slope, the body travelled 20 m in 10 seconds. After this, a force 𝐹 started to act on the body along the line of greatest slope up the plane. As a result of this force, the body began accelerating uniformly at 308 cm/s2 up the slope. Determine s i n 𝜃 and the force 𝐹 . Take 𝑔 = 9 . 8 / m s 2 . A body was placed at the top of a smooth inclined plane of length 25.2 m and height 13 m. It was left to slide down the plane. At the same moment, another body was projected at 14 m/s from the bottom up the line of greatest slope. Determine the time 𝑡 at which the two bodies met and the distance covered by any of the bodies in this time. A body of mass 476 g was placed on a smooth plane inclined at an angle 𝜃 to the horizontal, where s i n 𝜃 = 3 5 . A force of 476 g-wt was acting on the body along the line of greatest slope up the plane. If the force only acted on the body for 3 seconds then disappeared, find the distance that the body ascended the plane before it momentarily came to rest. Consider the acceleration due to gravity to be 9.8 m/s2. A body of mass 1.3 kg was moving along the line of greatest slope of a smooth plane inclined at 6 0 ∘ to the horizontal. A force of 10 kg-wt was acting on the body with its line of action making an angle of 3 0 ∘ upwards to the horizontal and directed towards the plane. Find the acceleration of the body rounding to the nearest two decimal places. Take 𝑔 = 9 . 8 / m s 2 . A body of mass 9 kg is released from rest on a smooth inclined plane. It moves a distance of 25.2 m in the first 4 seconds of its motion. If the body is projected upwards along a line of greatest slope on the same plane, with an initial velocity of 12.6 m/s, how far does it travel before coming to instantaneous rest? Take 𝑔 = 9 . 8 / m s 2 . A body of mass 30 kg is on a smooth plane inclined at an angle 𝜃 to the horizontal, where s i n 𝜃 = 1 5 . It moves up the plane under the action of a force which is at an angle 𝜙 to the plane where s i n 𝜙 = 3 5 . Given that the body starts from rest and moves 299 cm in 5 1 4 s, find the magnitude of the force. Take 𝑔 = 9 . 8 / m s 2 . A body of mass 49 kg was placed on a smooth plane inclined at an angle 𝜃 to the horizontal, where s i n 𝜃 = 1 2 1 5 . A force ⃑ 𝐹 =  ( 𝑎 + 5 ) ⃑ 𝑖 + ( 𝑏 + 6 ) ⃑ 𝑗  k g - w t is acting on the body, where ⃑ 𝑖 and ⃑ 𝑗 are unit vectors, such that ⃑ 𝑖 is in the direction of the line of greatest slope up the plane, and ⃑ 𝑗 is the upward perpendicular to the plane. The force caused the body to start moving from rest such that it travelled 145 m up the slope in 10 seconds. Given that the reaction of the plane to the body is 39 kg-wt, and the acceleration due to gravity is 9.8 m/s2, find the values of 𝑎 and 𝑏 . A body weighing 14 N was placed on a smooth plane inclined to the horizontal at an angle 𝜃 , where s i n 𝜃 = 3 5 . Let ⃑ 𝑖 be the unit vector in the direction of the line of greatest slope up the plane, and ⃑ 𝑗 be the unit vector upward and perpendicular to the plane. There are three forces acting on the body in the ⃑ 𝑖 - ⃑ 𝑗 plane: ⃑ 𝐹 =  − ⃑ 𝑖 + ⃑ 𝑗  1 N , ⃑ 𝐹 =  − 7 ⃑ 𝑖  2 N , and ⃑ 𝐹 =  9 ⃑ 𝑖  3 N . Given that the acceleration due to gravity is 9.8 m/s2, find the magnitude and direction of the body’s acceleration. A body of mass 20 kg is on a smooth plane inclined at 3 0 ∘ to the horizontal. A force of magnitude 133 N directed up the plane, parallel to a line of greatest slope, acts on the body. Given that the body starts from rest, determine its speed, 𝑣 , after 1 3 s.
At 1 3 s, the force is removed and the body continues to move up the slope. Determine the distance covered by the body before it comes to instantaneous rest. Take 𝑔 = 9 . 8 / m s 2 . A body of mass 484 g was placed on a smooth plane inclined at an angle 𝜃 to the horizontal, where s i n 𝜃 = 3 5 . Given that a force of 484 g-wt was acting on the body parallel to the line of greatest slope up the plane, find the acceleration of motion. Consider the acceleration due to gravity to be 9.8 m/s2. A body slides down a smooth plane under the action of its weight. Which of the following variables does the acceleration of the body depend on? A body of mass 11 kg was placed on a smooth plane inclined at an angle 𝜃 to the horizontal, where s i n 𝜃 = 3 5 . 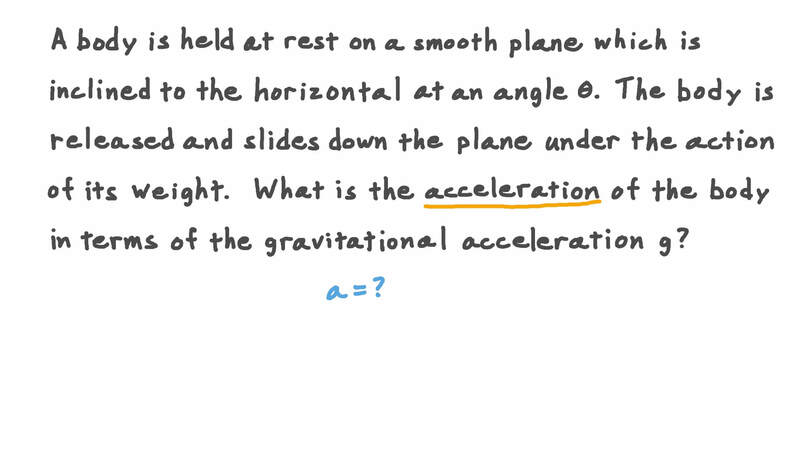 A force 𝐹 is acting on the body along the line of greatest slope up the plane. Given that the body moved 3.2 metres in 4 seconds, determine the magnitude of the force 𝐹 and the normal reaction of the plane 𝑅 . Consider the acceleration due to gravity to be 9.8 m/s2.